At Sportreat & TotaLife Care, we believe that exercising doesn’t need to be difficult, or scary! So we got together with our Exercise Physiologist, Nicole, to talk about some common excuses and how people can use those excuses to find a form of exercise that is perfect for them! Solution: “How much television do you watch?” – During your tv shows/ad breaks you can do some floor exercises or use resistance bands for strength training, or walk in place. You could also record your shows and watch them later, skipping the ads; use that time to exercise. 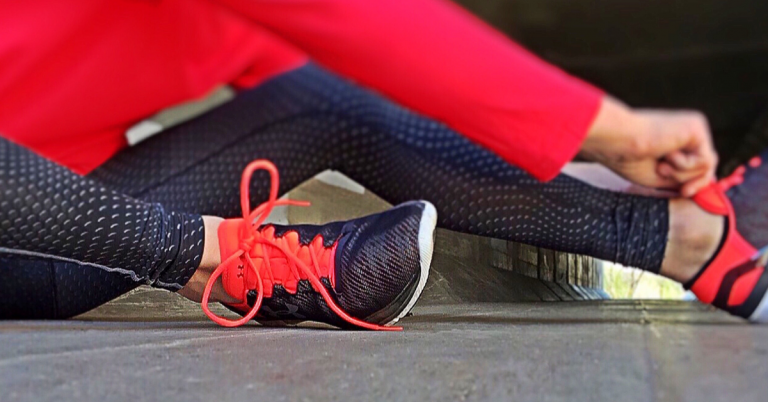 If you don’t have a long stretch of time, you could break up your workout into shorter sessions. Some activity is better than none. You can also download an exercise app to help you stay motivated and on track. Solution: Working out actually gives you more energy. Your body makes feel-good hormones (endorphins), and you’re getting the circulation going. Not a morning person? No problem. Do it whenever you feel best, in your lunch break or on your way home from work. Solution: “Take the kids with you,”. While they’re playing, you can walk around the playground, or During their games or sports practices, walk briskly around the field. When Mum or Dad is more fit, has more energy, the whole family benefits. Solution: Find an activity you love. Try inline skating, dancing, or gardening. Join a sports league. Or go dancing. “There’s an exercise for everyone. If it makes exercise more enjoyable for you, it’s OK to watch TV or read while you’re on the exercise bike or treadmill, as long as your workout is still challenging. Get some friends to go with you, or join a group. And every once in a while, try something totally new so that you don’t get bored. Solution: First, figure out why. If it’s because you have poor mobility/joint pain – see an exercise physiologist to prescribe exercise appropriate for you. Is it that you don’t like getting sweaty? You can work out indoors where it’s air conditioned. You can swim so you won’t notice any perspiration. Or try a low-sweat activity, like gentle types of yoga or Clinical Pilates. Is it hard on your joints? Head for the pool. Exercising in water is easier on your joints. The stronger your muscles get, the more they can support your joints and the less you’ll hurt. If your physical limitations are more serious, check with your doctor, or find an exercise physiologist who can help you figure out exercises that are still safe and easy to do. If you’re self-conscious about your weight, you could start by walking with friends, working out in the privacy of your home, or exercising with a trainer who’s supportive. Wear clothes that feel comfortable. Exercise Excuse No. 6: ‘I’ve Tried Before. Solution: Set goals that are small and realistic. Then you’re more likely to feel like a success, not a failure. It also helps to keep a log and tell friends/family. A log also helps you see if you’re starting to fall off the wagon (or the treadmill). Having an exercise buddy keeps you accountable as well, you may be more likely to show up for your workout if you know someone is expecting you to be there. Our Exercise Physiologist, Nicole, is here to provide prescribed exercise programs to those who are recovering from injury or surgery, have chronic conditions, those who want to improve their joint integrity and function, and can help people of all ages get back into fitness. Read more about Exercise Physiology here or call 9438 2400 to book an appointment! If you’re covered for Exercise Physiology by your private health, you’ll just pay the gap payment. 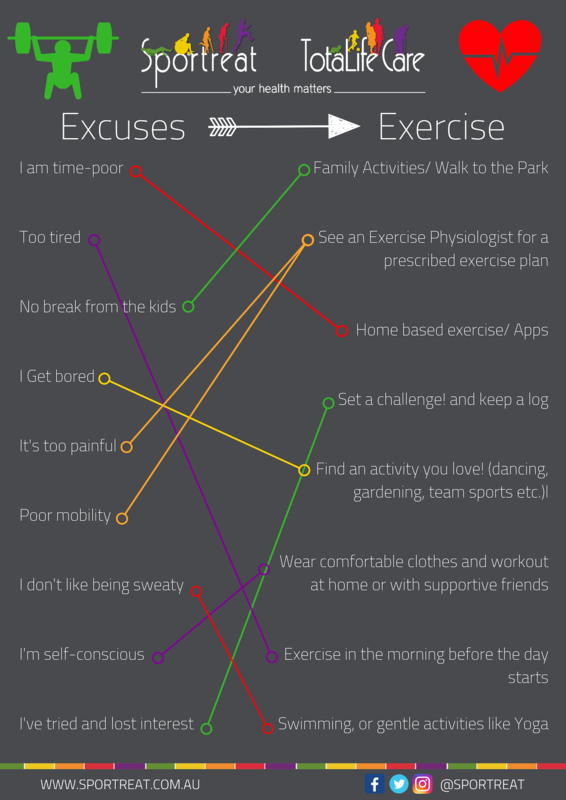 Use our Excuse -> Exercise Matcher Below to find your ideal exercise!